We all need an iman boost sometimes, right? 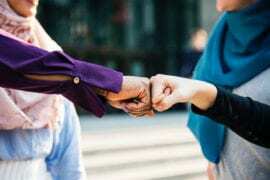 With the blessed month of Ramadan approaching, many of us feel the need to rekindle our iman in order to reconnect the best way we can with our Creator . But some things always seem to be standing in our way. In this article, we asked our top spirituality writers to open up their hearts to our readers and share their personal tips on how to boost one’s iman and get our spiritual focus ready for Ramadan. There comes a time at night when you’re finally done with a hectic day and you’re in bed alone with your thoughts. That moment, right before you close your eyes when you think “How am I feeling?”, “Was I good today?”, “Will I ever find what I’m looking for?”. That honest moment when the distractions drown away and we listen to the one voice in our heads and all the questions it has for us. Is it just me, or does that voice seem to go all out the closer we get to the month of Ramadan? Lawyer, preacher and judge. It abuses me with everything that I am and everything that I’m not. I wish someone could tell me how to shut it up sometimes! It’s bedtime for God’s sake! And so I soothe myself with one thought: I’m not alone. Allah is here so I ask Him for help on how to silence the thoughts of me not being good enough, and vow to be better tomorrow. Without that sincere desperation for guidance, I don’t think I would have the will to even wake up the next day. So yeah, that’s my first tip. Ask Allah for more genuine faith. Boy, do we ever need it! When I was 11, I asked my mom “What’s the best thing I can do to make God happy?”. She said “Love for others what you love for yourself.” At that time, I automatically thought “Since I love when my parents buy me chocolates, I should give chocolates to those who don’t have parents!” And so I went to the orphanage (and yes I got beaten up because I didn’t have enough bars!) but since then it became a tradition that I cherish with all my heart. Give what you wish you could get, be it time, love, attention, money or even a smile. Treat people the way you wish they would treat you, and be happy for others the way you’d love them to be happy for you. Give. And don’t expect to get anything in return. The Giver will make sure you do get rewarded when the time is right. My third tip is to stay humble enough to serve others. That’s really what we are here for anyway. The second you start feeling you’re “all that” is a big sign of danger! (I recommend you deliberately shudder to remind yourself of how huge that is). Humility is the core of our religion. When you give up your seat for an older woman and when you help take out the garbage, pause and feel the light of modesty shining your face and heart. It’s a glow that brightens their world and ours, and a genuine feeling of satisfaction that is just incomparable. As much as I wish to maintain reading Qur’an daily, I still make it a point to never ever miss reading Surat Al Kahf on Fridays. That’s my forth and foremost tip to boost one’s iman since it’s recommended by the beloved . The blessed light this chapter brings and the lessons it teaches us every week is all what we need to recharge. And it’s magically blissful, too! Once you’re hooked to this habit, there’s no turning back; it sort of grows on you. Finally, my last tip is to live the ‘now’ when you stand before your Lord. I remember hearing a story about one of the companions who shivered once it was time for prayer. He would say, “Do you understand who I’m about to meet? Allah Himself!” Now that’s a man who got it right. Pause your mind, open your heart and submit your soul to the One and Only Lord . Prayers are not aerobics, they’re the pillars of your faith. If you pray right then everything else in your life becomes right. Whatever is on your mind at that time can wait. Practice salah the way people practice meditation. I wish we had some kind of 9D glasses to see just how positive of an effect praying has in cleansing our inner beings. I ask Allah to give us the humility to serve each other, to teach, learn and help and focus on what really matters in this life: pleasing Him . That’s all for now folks. Wishing you a beautifully blessed Ramadan. And please remember me in your dua (yeah, even if you already know and apply all those tips! I’m greedy that way). If you’re feeling low in iman, realize that this is not a disaster. We all have our ups and downs, and you need to experience the lows in order to fully appreciate the highs. Think of it as a normal cycle of life, and a test from Allah . Make a sincere intention to work on your iman, and as you go along, remember to renew that intention regularly (because intentions can become confused and contaminated over time). Make dua, asking Allah to assist you in this. Acknowledge your own weakness – i.e. that you alone cannot succeed in this, and that you are dependent on His Mercy and help. Repeat that dua regularly, and try to make the dua at the times of acceptance. Cut down your sins: While iman can be boosted by doing good actions, it’s equally important to stop doing the bad ones that hamper our iman. Think of it as a bucket with holes in it: you want to fill your bucket with water, but if you don’t patch up those holes, your water is just going to keep draining away, so you’ll not really succeed in filling the bucket. Sins are like that; they drain the barakah from your life, slowly or quickly, whether you notice it or not. So, when you’re feeling low in terms of iman, look at what your sins or bad habits are, then try to reduce or eliminate them. Remember that in many cases, you won’t be able to just stop instantly, so break things down into small but consistent steps. Each day, try to reduce your indulgence in that action, and slowly but surely, In sha Allah, you will patch up those holes. Prioritize salah: As mentioned by our Prophet , salah is a critical part of our deen. If you aren’t already keeping all your compulsory prayers, try to build up to that. If you are making them all, try to get them on time and in the masjid (for males). If concentration (khushu’) is an issue, work on it. No matter how low your iman is, there will always be work to do in terms of improving your salah. So work on that and In sha Allah one aspect of your iman-boosting plan will come into place. Along with salah, another majorly essential aspect of the deen is the word of Allah , the guidance, mercy and cure which Allah has sent to us, to you personally. Do not see the Qur’an as some abstract religious text which is far from you. Consider it as a message, a personal message from the Lord of all the worlds to you. It’s there to guide you; to cure you of your troubles; to give you comfort in your times of need and your times of ease; to remind you of the purpose of your life. So, no matter how your current relationship with the Qur’an is, try to improve it – again, slowly but surely. Through the barakah of prioritizing the Word of Allah , In sha Allah your iman will receive continuous and immense boosts. Many times, your iman may become damaged because you are surrounded by people who either disregard deen completely or they just don’t prioritize it the way they should. It is human nature to be influenced by the people around you, even if you outwardly know their company is detrimental to your iman. So, if you’re spending most of your time with people like this, try to change your company so that you are more often with people that will boost your iman rather than damage it. 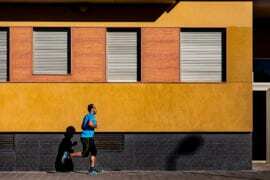 Fix your environment: Similarly, your physical environment plays a major role. When you’re constantly surrounded by materialism, indecent advertising, music with harmful messages, and sights and sounds that incur the displeasure of Allah rather than His pleasure, you’re bound to be negatively affected. The unfortunate reality is that in many of our societies today, we are immersed in exactly those ills. So, do what you can to minimize the time you spend in these dangerous environments. For example, make the choice to spend more time in the masjid when you feel like going to the mall. When you feel the urge to turn on the TV, find a quiet spot to go and read something beneficial, make dhikr, or do something else that is pleasing to Allah . Protect your senses: When you do find yourself in an environment of sin, protect your senses from ‘spiritual filth’: stay away from sights and sounds that would corrupt your heart, and if you do see or hear them, immediately try to erase their effects by replacing those experiences with something better. For example, if you hear dirty music around you, recite or listen to Qur’an immediately and let that push the music out of your memory. Establish your prayer! The first thing we will be held accountable for on the Day of Judgement is ‘prayer’. Since it is the first thing we will be asked about, it is also the first thing shaytan tries to ruin for us. It is therefore always a good idea to begin by focusing on this before anything else. A common problem that most of us have probably experienced or are experiencing in our lives now, is the struggle to be regular in our prayers. We are all at different stages, some of us struggle to pray at all, whilst others slip by missing one or two. Either way, our first point of focus when working on boosting our iman is that we should maintain our prayer. For many of us it is easier said than done; so I’d like to share a few tips of my own that have helped me in the past, and will surely help you too In sha Allah. First, make a plan. Fail to prepare; prepare to fail! This does not necessarily mean you have to plan your whole day hour to hour, minute to minute, unless you are blessed with organizational skills I so badly lack! This simply involves being aware of prayer times against your day-to-day routine tasks so that you can arrange your day in a way that makes you able to pray on time. Just planning this in your head the night before can make a world’s difference. And never forget that Allah’s mercy is so great that even our intentions of good are rewarded, subhanAllah! So, it really is a win-win situation! Always plan your days until you have established a good routine that involves your five daily prayers. A wise woman once told me, fake it till you make it! And I couldn’t agree more. It is a common complaint of people who struggle with prayer that they do not feel connected and so they struggle to pray. However, that is exactly where shaytan wants you! Prayer is in itself an iman booster; the more you pray, the more you’ll want to pray. And the more you pray, the closer you become to Allah and your other actions will follow suit, In sha Allah. So whether you feel it to begin with or not, break free from shaytan’s hold by making yourself pray until you naturally from your heart (and you will!) become regular in your prayers. The five fardh prayers are of course our main priority. However, I have found that sometimes, especially in difficult times, an extra nafl prayer and a long heartfelt sujood empowers me in a very unique way. We all go through an array of emotions throughout our day or week – it is human nature, so take advantage of those moments when you crave closeness to Allah . As with any act we do, when our full emotions are engaged, they have a greater impact. Now whether that means gearing yourself up for a prayer of pure khushu’ through other acts of worship or reminders (see tip 3 below) beforehand, or taking advantage of your humble moments, don’t be afraid to bring your emotions into it. Prevention of sinning = removal of barriers! In order to be successful at anything, you must eliminate barriers that prevent you from attaining your goal. Sins are the biggest barrier before the one who is striving to be on the right path as they decrease iman and create a distance between you and Allah . To increase our iman is to get closer to Allah . However, many verses of the Qur’an and hadith have warned us from sinning. Our deeds, good or bad, most often lead to acts of the same nature. One sin leads to another and this weakens our heart. It is harder to follow a sin with a good deed because of the instant barrier the sin places between us and Allah . Even the best of us sin; it is human nature to make mistakes. However, this theory also works in reverse! When we do good deeds, we strengthen our bond with Allah and we are more likely to proceed to do good. So remove the barrier between you and Allah . Make sinning more difficult to yourself by avoiding acts that displease Allah , and instead do more good deeds and automatically this will open doors to more goodness and it will increase your iman. If you struggle to abstain from sins, fast! Fasting disciplines our minds and bodies and humbles us to submit to Allah . There is wisdom behind the Prophet’s sunnah to fast every Monday and Thursday and it is a suggested way to keep us away from sins. Regular reminders are key to boosting our iman. It is interesting to note that the Arabic word for human is ‘insan’ which is derived from the word ‘nasiya’ which means ‘to forget’. It is in our human nature to forget and make mistakes and that is why we must make a conscious effort to remind ourselves daily of Allah and our goal to attain His pleasure. Forgetfulness is one of shaytan’s tricks. When we are in a state of constant remembrance, we are the closest to Allah . There is a quote I’m reminded of: “Whatever occupies your mind the most becomes your God”, which I feel describes the state of the human being or ‘insan’ so perfectly. When you occupy your mind with Allah , then He becomes the purpose and goal of your existence, and when you occupy your mind with dunya (worldly life) then the dunya will become your god and your existence. Your actions will reflect what really occupies your mind and heart the most. It is very easy to lose ourselves amidst the busy hectic lives we live. It is therefore always important to remind ourselves of our purpose, our history and the promised Judgment. 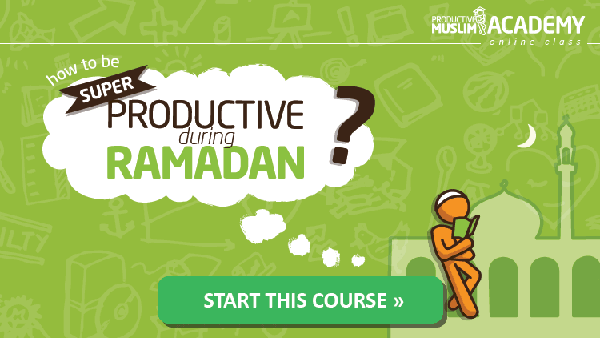 Make it a priority to attend regular Islamic classes/circles, if you have the means to do so. Personally, I have found that attending an Islamic course along with weekly classes brought a huge benefit in regularly fueling my iman. Increasing my knowledge of the deen through these classes also encouraged me to constantly improve myself. If you have access to any talks, courses or Islamic circles around you, then take full advantage of them and make every effort to attend. This will surely help preserve and increase your iman, In sha Allah. If you are not able to physically attend classes/circles, then classes and lectures on the Internet could be a good option. The Internet, with all its disadvantageous frills, can in fact be a very useful tool in boosting your iman. I have found YouTube talks and online articles to be a great way of having regular reminders during my busy life as I could watch/read them anytime and on almost any topic I please! Physically attending a class as opposed to listening to a talk online, in my opinion, has a greater impact as it has the advantages of surrounding yourself with good company and a good encouraging environment. It also helps to ensure you do not become lazy in your efforts as you have a greater sense of commitment and encouragement from the group. Know your circle and the company you keep! When you sit with the people of the dunya, you become a drop in the ocean of the world. When you sit with the people of the akhirah (Hereafter), the dunya becomes a drop in your ocean. So spend time with those who have knowledge and those who are practicing because the company we keep has a huge impact on our personalities. If you have not noticed it already, be wary of the way you act, speak and think when you are around different groups of friends and truly reflect on which people boost your iman and which deflate it. Perhaps the best advice I can give to anybody truly wanting to turn to and stay steadfast on the right path, is to spend time with people of the deen. Surround yourself with those who will remind you of Allah because they are your true friends and they will help you to attain jannah. If they keep you away from Allah , then they must go! Strengthen your mind and believe in yourself! Now this isn’t a practical tip as such, but in good psychologist spirit, I could not forget the power of our minds in my top tips! The absolute key to boosting your iman is to believe in yourself and believe in Allah’s mercy and His love for us. I often hear of people in despair because they feel distant from Allah ; they want to become better Muslims but for some reason, they just cannot battle their hardened hearts. Maybe you are reading this because you too feel that? This is a good sign. It means your heart is not the problem. You are reading this because you intend to increase your iman, but one thing you should know is that the only thing stopping you from fully embracing your love for Allah and His love for you, is your mind. Your mind is the most powerful tool you can utilize to succeed in any of our ‘top tips’. It is a matter of discipline, but it is also one of the most difficult issues to battle with. Shaytan targets our mind, because that is where humans are most weak. The reason we find it easier to do good and abstain from sin during Ramadan is not because fasting softens our heart, but because it strengthens our mind through discipline and willpower. Shaytan targets our minds, filling us with discouraging thoughts like “five more minutes and then I will get up for Fajr!” or “I’ve sinned too much to be able to repent now”. We must strengthen our minds and ignore those whispers. No matter how hard it is, you must force yourself away from such thoughts by oft-repeating ‘Audhubillah min al-shaitan al-rajeem’ (I seek protection from Allah against the accursed devil) and redirecting yourself towards Allah . Never give up, never lose faith in Allah and believe in yourself! Discouragement is from shaytan, so don’t let him win the battle. Your mind is as strong as you train it to be. 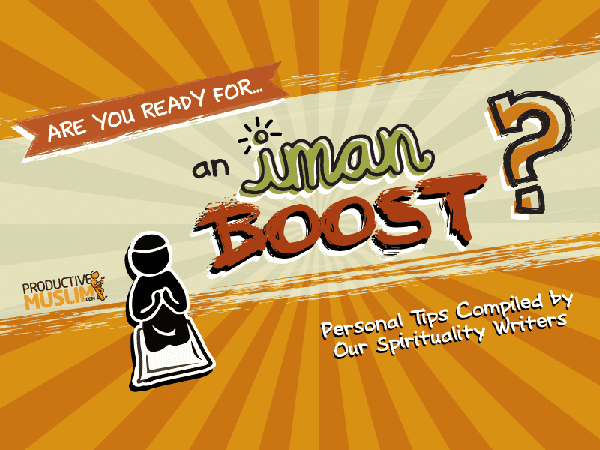 Share this article with friends and family so everyone around you too gets the iman boost they need for Ramadan! What do you do when you feel your iman dropping? Share your tips with us in a comment below. Yacoob Manjoo is a writer, blogger, husband, and father of two. Writing is his passion, and sharing beneficial knowledge and insights has been a pillar of his life for more than a decade. He blogs at dreamlife.wordpress.com.